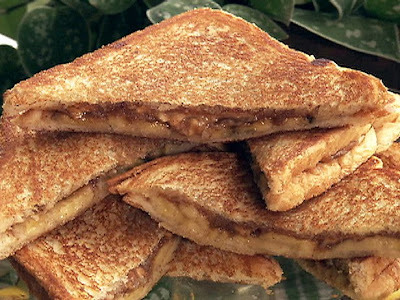 In honor of what would have been Elvis Presley's 75th birthday, today I'm going to share with you one of my favorite sandwiches — Peanut Butter and Banana. I, like I'm sure many of you are, am a huge Elvis Presley fan. Loved him, his music and his movies. Of course, his beach movies were my favorites — Blue Hawaii and Girl Crazy are at the top of my list. Elvis isn't actually at the Tiki Hut today, but his spirit lives on. Its hard to find a photo of Elvis that is not copyrighted, but this one taken with then President Richard M. Nixon was taken by a White House photographer, thus it is in the public domain. 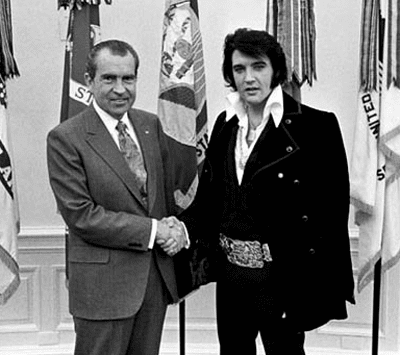 Elvis met with Nixon that day because he was concerned about the country and wanted to become a "Federal Agent at Large" in the war on drugs. A bit ironic given the circumstances of his death, but the story is fascinating. You can view all the photos taken that day and the documents, including Elvis' letter to the president at this link to the National Archives. If you look around the internet you will see many versions of this sandwich. My understanding is that Elvis ate this sandwich fried; I've had it that way many times. I grill mine in a non-stick pan sprayed with canola oil. If Elvis ate it like this, I would imagine it would have been fried in bacon grease. When I was a kid, just about everything was fried in bacon grease — it was the Southern way. Typically though, I simply spread peanut butter on a slice of good white or oatmeal bread and top it with sliced bananas and another slice of bread. What could be easier? I love this sandwich and have been eating it for more years than I can remember. Peanut butter and bananas are good for you, although the peanut butter should be eaten in moderation — I need to learn moderation. Since I know many of us are big Paula Deen fans, I'm providing you with her version as well. Looks good, but too time-consuming for me when I'm working. I take the easy way out and I'm good with that. Update: I almost forgot, I have a foodie question for you today! Creamy, Chunky, or Super Chunky, which is your favorite style of peanut butter? A big glass of milk goes perfect with this sandwich! 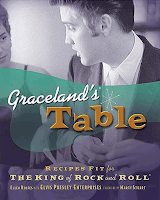 Graceland's Table is the first cookbook written with the full cooperation of Elvis Presley Enterprises. In addition to recipes from fans for Elvis, the book includes photographs of Elvis at home and full-color food photos taken in Graceland for the book. The 175 recipes in Graceland's Table come from two sources: EPE's archives of Elvis's favorite recipes and Elvis's fans. If your interested, this book is available at Shellbelle's Tiki Hut Store powered by Amazon. Be sure to click on this banner to visit Michael and find links to other Foodie Friday participants who are sharing recipes today. That sandwich sounds amazing. I wish I had one right now for breakfast. I too am a huge Elvis fan. Have a great day. I was never a big fan of Elvis, lol... don't hate me yet, when he first started singing I was a young teen and kind of, if my sister likes it, I don't type...silly me, it took awhile to admit I thought he was sooo great...lol...I did enjoy his music and the fact that he was born in my State, he was a very talented man and so sad to lose him like we did. You story is so interesting, I'd never heard it before. I will save the link and read more when I have time. I also love P&B sandwiches and do mine much like you do, but my waistline shows it...so Nutrsystem is my choice of foods right now. Great post, Rhonda. It is always neat to learn a few things...and today it is Elvis. I love the outfit he chose to wear to meet the President!! The sandwich...I have a thing about mixing peanut butter with anything; chocolate, cookies, ice cream, candy...I just love it all by itself, so I sort of squirm to think about your childhood favorite! btw, I'll make your recipe over Paula's, I like her a lot but yours will save me time and thats a good thing! I ordered the t shirt I cant wait to wear it, thank you so much!! Thanks for the heads up on my comment section. I think it's ok now. Elvis lives right here in your blog. Loved the lights at the Botanical Gardens, but I agree that your FFB with Claudia is very special. It even comes before Elvis. You sound like my kind of girl. I must admit a fondness for peanut butter and banana sandwiches. I really loved this post. As to your question, I'm a chunky peanut butter gal. 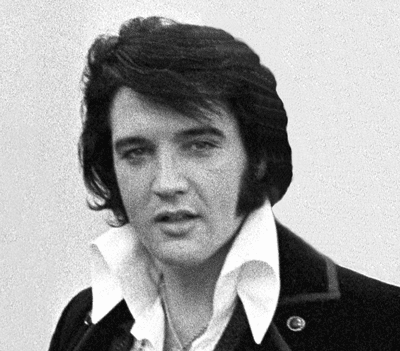 Oh I just bet Elvis is rocking tonight somewhere and I so hope he can enjoy all the peanut butter and banana sandwiches he wants now! Glad you found me on beachsnaps...so few people have! Now that I have you for a follower I'll feel more motivated about posting my beach photos. Fun to know you're just north of me about an hour and a half. We were in Tampa just this evening picking up our son and his wife at the airport. We're heading over to Disney where Adam will run a full marathon on Sunday...Brrrr....he's from Iowa, though, so should be well acclimated to cold weather. I'll be back to visit your blog! Thanks for stopping by and getting me moving on more beach snaps. Hi, Rhonda... I love Elvis, and I miss him! Chunky... I haven't had super chunkym, but that could be a rival to chunky. This is a wonderful post. Rhonda! I didn't know Elvus wanted to be a "special agent." I love the "Elvis" sandwich and I used to make it for my children when they were growing up. They preferred smooth peanut butter, but I like chunky. Paula's recipe sounds good, it sounds almost like dessert! I'll pray for your nephews safe return !! Happy birthday to the King. I love his music... Always On My Mind is one of my favorites. And creamy... the creamier the better! Oh I love PB! I loved Elivs as a preteen and so wanted to marry him~~`it didn't happen. Never had a peanut butter and banana sandwich until I was married. And have never had it fried...I will pass this info on to my husband. Thought it was plain or peanut...didn't know about super chunky...learned another thing today..Thanks.. Love Peanut!! Chunky for me! I actually made Paula's recipe once. It was wonderful...way too much butter and since I'm not used to eating that way, I was full for a long time after. I was never an Elvis fan...although almost everyone I know was/is. The only record I ever owned was the 45 (I'm old) of Suspicious Minds. Great tribute to Elvis and his famous sandwich. Long live the King of Rock and Roll. When my husband was growing up he loved peanut butter (still does) but prefers chunky. His mother always bought smooth and he'll never forget it. I always wanted to ask her why she didn't buy chunky, but never did. You better believe I always, always buy chunky for him. What a great way to celebrate and remember Elvis's birthday. I never knew that was his favorite sandwich. Stella is still having a ball with Sheila! Hope you are having a great weekend and I hope your weather warms up for you soon. What you are experiencing is probably the same as our summer. LOL. Saw sleet this morning...and DIL had quite a bit on her way to work. In PH and Tampa!!! Did you hear that the iguanas were falling out of the trees in South FL...freezing and just dropping onto the ground!!! Yikes! We were in TN when the last major cold hit FL...frozen pipes, schools closed for weeks because school buses could not maneuver the winding roads... Oh well...we could be in North Dakota! Great minds think alike :) Loved your post! OMG. I think I have to buy peanut butter now and make this..., without the honey and the sugar though, but I have the feeling it'll still taste awesome. Oh, and I love Elvis. Took a tour once of Graceland too. I remember seeing this sandwich on the menu of a restaurant in Memphis. Never tried it though. If I'm going to wear THIS many calories on my hips, I want chocolate in it. Thanks for the Post! It is hard to choose a favorite. Thai food is one of mine. We have a dear friend (she owns our favorite thai restaurant) We became friends through eating at her restaurant for 8 years just about every week. The Fried PB and Banana sandwiches look awesome! I will have to make this for my husband sometime!